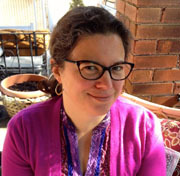 Karen Ruffle, Associate Professor of History of Religions (UTM) and the Study of Religion (UTSG), specializes in the study of South Asian Shiʿism. Her research and teaching interests focus on devotional texts, ritual practice, and Shiʿi material practices in South Asia. She has conducted field research in India, Pakistan, Iran, and Syria. Her first book, Gender, Sainthood, and Everyday Practice in South Asian Shi’ism, was published by the University of North Carolina Press in 2011. Ruffle’s most current research and publications focus on issues of material practices in the Deccan region of Indian, particularly role of relics and the senses in shaping Shiʿism under the Qutb Shahi sultans in the 16th and 17th centuries. She is currently working on two book projects. The first, Everyday Shiʿism, is an introductory textbook focusing on "lived Shiʿism" in South Asia. The second project, Sensational Muharram in Qutb Shahi Hyderabad, 1591-1672, examines how one South Asian Shi’i community participates in the religious sensorium, a symbolically rich social space through which ritual practitioners engage with material objects and the body to produce sense-experiences that trigger historical memory and invoke the presence of the Imams and Ahl-e Bait.